Hyderabad: Instances of cyber fraudsters targeting the gullible through matrimonial websites have been on the rise of late and several persons from the city, mostly women, have fallen prey to such frauds and lost money in huge sums. Police sources said the cybercrime cells of Cyberabad and Hyderabad police had received about 30 complaints in the last six months. There were many cases that go unreported as well due to the social stigma attached to it, they said. 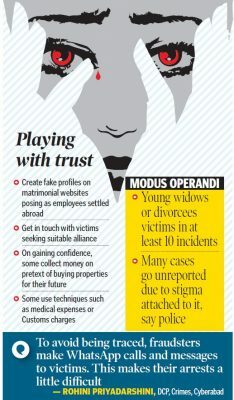 The modus operandi of these fraudsters is that they got in touch with the victims through reputed matrimonial websites seeking suitable alliance. On gaining confidence, some collected money on the pretext of buying properties for their future while others used techniques such as medical expenses or customs charges. A couple of weeks ago, a young man was duped by a woman in Medchal by the ‘Defence Matrimony’, a branch of Bharat Matrimony. The victim in police complaint stated that they had both come into contact on the site and exchanged numbers. When he proposed marriage, she accepted. She recently called him informing she was coming down to Hyderabad. On the day of arrival, she called him up saying she was detained at the Rajiv Gandhi International Airport by the Customs officials and asked him to transfer money into her account towards some expenses. In the last six months, there were at least 10 incidents that were reported in which the victims were young widows or divorcees. “Normally, women in such condition are a little depressed and are gullible to sweet talk. They are easily trapped by these fraudsters. This is taken as an advantage by them,” said a cybercrime official. According to the police, the fraudsters create fake profiles on matrimonial websites posing as software professionals, engineers, doctors or marketing professionals settled in a foreign country, and target men and women seeking an alliance. These miscreants operate in gangs and are mostly based outside the city in Mumbai and Delhi, she added. “To avoid being traced, they make WhatsApp calls and messages to the victims. This makes their arrests a little difficult,” the official said. Officials said the fraudsters establish trust and get close to victims through mails, online chats or at times even phone calls. They then propose marriage and cook up a story such as gifts or foreign exchange that they were bringing into the country being stopped at the airport by Customs officials and needed to be cleared requiring money. Sometimes, they even say someone close in the family has fallen sick, and they need some urgent money, which will be returned soon. “Believing the stories, victims fall prey and transfer the money into their bank accounts online. And then they go absconding,” said an official. The SHE Teams, Cyberabad, receives several complaints from women who were cheated on matrimonial sites. “Many are not able to differentiate between a genuine and a fake profile and become victims of fraud. Fraudsters do not reveal their details about their past and post false information. One needs to be extra careful while contacting an alliance particularly those from abroad. It is wise to never fully trust a person till you meet them in person,” the police official said.